Drag and drop food onto the children’s’ plates to help combat child poverty in Dusseldorf. With every schnitzel, cheese sandwich or curd dessert you drop on their plate, the website adds more to your donation. Very well done. A Gold Lion winner at Cannes. Check it out here. Facebook, a better referrer than Google? Adage just ran an interesting article on the power of Facebook v Google (or, social media v search engines). A recent Hitwise report shows that Facebook is actually sending more traffic to a number of sites than Google. 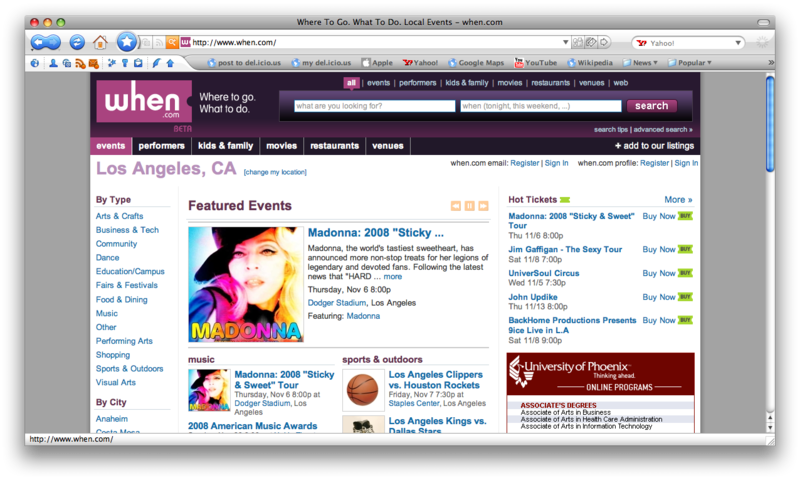 Specifically, sites like Perez Hilton, Dlisted, Cafe Mom, eVite, Twitter and Tagged. This is kinda crazy. First of all, Google’s scale alone eclipses Facebook almost 3 to 1 in terms of unique visitors. Second of all, search engines are built to refer traffic. Their primary function is to direct people to other sites. And yet, Facebook–a destination site–still manages to beat them at their own job. The lesson: 1. Peer-to-peer referrals are invaluable in marketing. When your friends tell you to go to a site, you go. When they post a video, you watch. Simple math. 2. SEO and SEM have to incorporate social media 3. Google will probably retaliate. Do you think it will be via a partnership with Facebook or adding social functions to it’s existing engine? Au revoir free content online? We have been pretty lucky when it comes to online content. Advertisers pay online publishers so we don’t have to. We can go to YouTube and watch videos, NYT and read the news, Facebook and catch up with friends and never pay a dime. I know I often take this for granted. Honestly, I don’t even see it as a luxury. Why would I have to pay for that? And most of the general public feels the same way. If you don’t speak their language, find someone who does. Obama brought in Chris Hughes from Facebook to run his online strategy. Hughes is responsible for the website, blog, community site and social media strategy. Go to them, don’t make them come to you. Deliver the message where the people are already assembled. Facebook makes it pretty easy to reach the right audience. There is a wealth of targeting information on that site. 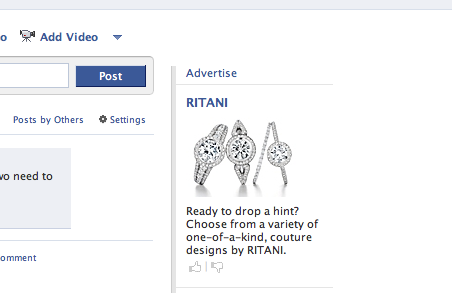 So, I ask you Ritani, why place a banner promoting engagement rings on a girl’s profile page when she is clearly listed as SINGLE? Don’t dangle those diamonds to a chick who just ain’t there. Targeting 101. Reverse psychology makes people click on banners. 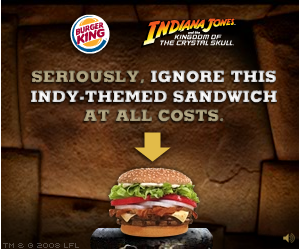 Check out the Burger King banner…whatever you do, don’t touch the sandwich…don’t touch it. The New York Post reports that ” The once-hot market for Web banners is not only cooling, it’s in danger of going subzero.” Looking at online ad companies earnings reports show the sharp decline. Marketers are rapidly pulling back on online display advertising, particularly “flashy” campaigns. Analysts are predicting that if the past few months are any indication, banner advertising will not even remain on the decline, it will go negative by 2009. It is understandable. With click-through rates at .1% it’s hard to justify the ROI. Even though people argue (myself included) you can’t grade a banner on it’s click-through rate, proving the value is still difficult. But I don’t know that banners are dead. They need a makeover for sure, but they can still pull through. It’s like TV. TV is not dead, bad TV is dead. Infomercials and “I’ve fallen and can’t get up.” There are so many bad banner campaigns out there. Just go to Myspace. Bad banner advertising is what is dead. Hopefully this will force people to be more diligent, creative and strategic when creating a banner campaign. 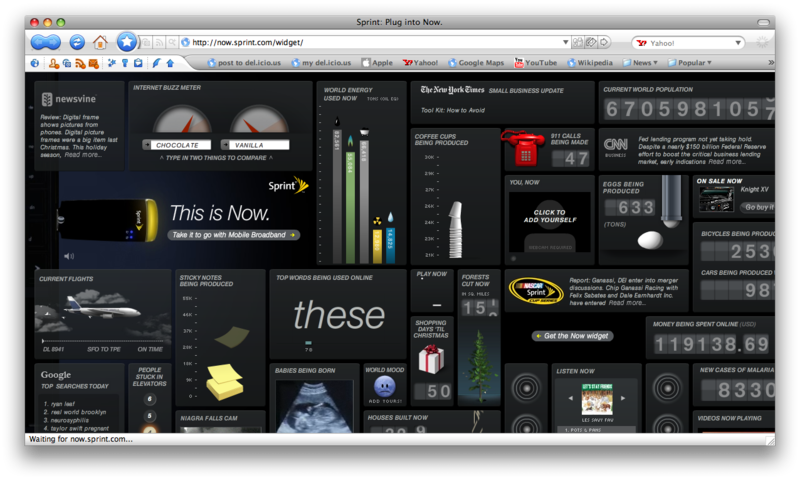 Also, maybe it’s time to change the standard sizes IAB? I mean there is nothing uglier than a 160×600. One last note in online paid media: search advertising continues to grow at an astounding pace. Thanks Google. I’m glad that just weeks after blogs were publicized in the media as “so 2004,” Media Life is heralding them as the best thing since sliced bread. Now, they do call out some interesting facts from the new Jupiter + Buzzlogic study. The fact that blogs beat out search as a navigation tool, that readers are more trustworthy and willing to click on banners on blogs. These are important facts that validate a movement that has been happening in media for the past five years. But it ain’t new news by any standard.